Ba Gua was created thousands of years ago. Ba Gua is sacred wisdom and practices to predict and guide people’s lives. For the first time Master Sha was guided to bring Ba Gua nature inside the body to support and maintain a human’s light body. Ba Gua nature includes Heaven, Earth, Fire, Water, Thunder, Wind, Mountain, Lake/Ocean. Listen to and sing with Master Sha on this CD. Benefit from the Ba Gua nature with this special CD. NOTE: Please allow 4-6 weeks for delivery. Ba Gua was created thousands of years ago. Ba Gua is sacred wisdom and practices to predict and guide people’s lives. For the first time Master Sha was guided to bring Ba Gua nature inside the body to support and maintain a human’s light body. Ba Gua nature includes Heaven, Earth, Fire, Water, Thunder, Wind, Mountain, Lake/Ocean. Listen to and sing with Master Sha on this CD. 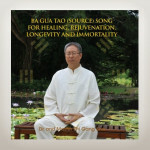 Benefit from the Ba Gua nature with this special CD. NOTE: Please allow 4-6 weeks for delivery.